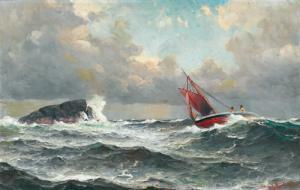 Find artworks, auction results, sale prices and pictures of Lars Laurits Larsen Haaland at auctions worldwide. 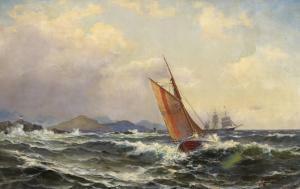 Lauritz Haaland Kvitsøy/Norwegen 1855 - 1938 , Norwegian Three-Master and Pilot Boat, Oil/canvas, 65 x 98 cm, lo. ri. sign. a. dat. 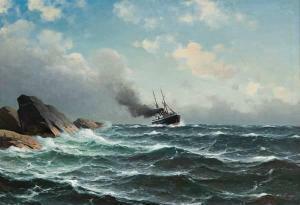 Lauritz Haaland 99., Norwegian marine painter. H. worked as shipbuilder in Bergen before studying at the Oslo art school since 1880. Thereafter he travelled Europe. 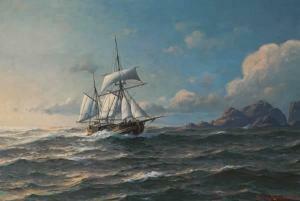 His meticolous ships, waves a. weather soon made him successful a. he exhibited a. sold not only in Europe but also in the USA.